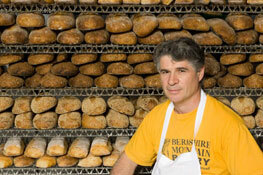 Walk through the door of Berkshire Mountain Bakery located in Housatonic, Massachusetts in the heart of the Berkshires and you will find yourself in the midst of a baking flurry with baker/owner, Richard Bourdon, orchestrating the production. In this European style bakery, traditional techniques rule the baking process and so most bread is naturally leavened with sourdough fermentation and hand shaped. The result is very digestible and delicious bread. For more information on the actual baking techniques, please see The Bread. Born some 50 years ago in Ville-Marie in northwestern Quebec, Richard initially pursued music as a career. At the age of 22 – while studying the French horn at The Hague Conservatory of Music – he decided to switch careers. With a serious interest in food, he placed an ad in the paper: “Interested in food production with either a farmer or a baker.” Who ever called first would be the path he pursued. As Richard likes to state with a smile, “If it had been a farmer to call first, we would be talking about carrots now.” After plying his trade with top bakers throughout The Netherlands, France and elsewhere in northern Europe, Richard settled in Amsterdam and ran a bakery there for six years. In 1985, while working in Holland, he met Michio and Aveline Kushi, founders of the Kushi Institute in Becket that espouses the macrobiotic philosophy of life. The Kushis invited Richard to bring his bread to Becket where they had moved their institution. So, Richard likes to tell people that he and his family including three small children at the time arrived in this country in 1985 with a mere $300 in his pocket. Of course, challenges presented themselves immediately when he had trouble making his bread. The wheat here in the United States would not ferment the way it did in Europe. It took him several months of experimentation before he could match his techniques to U.S. ingredients. But he did figure it out and established a small operation in Becket to serve the foundation’s clients. 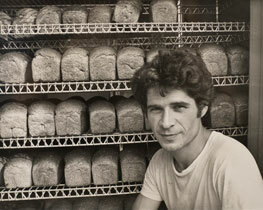 As the popularity of his bread grew, he began to dream of expansion. His dreams were answered when one of the institution’s clients, a woman from Chicago, loaned him sufficient funds to move and grow. This loan allowed Richard to move his operations to the village of Housatonic in 1986. By 1987, his production had reached 8,000 loaves a week versus 200 loaves in Becket completely exceeding this new location’s capacity. Now, he really needed more space. This time an organization called Southern Berkshire Investment Corp. was able to provide Berkshire Mountain Bakery with a six-figure loan that allowed Richard to move into his current location, a 7,000 sq. ft. brick warehouse that was previously used by the old paper mill, buy new equipment and pay off the original investors. Today, Berkshire Mountain Bakery has sales exceeding $1 million, employs on average 13-15 people and continues to produce some of the best bread you will ever taste. In addition, the bakery now has spelt and wheat pizza crusts, five varieties of frozen pizza and a new line of cookies that are distinguished by the flour, sweetener and shortening that they use. In other words, they are healthy and delicious. If you have the opportunity to meet Richard Bourdon you will be struck by his energy and drive. You can find him on any given day doing any of the following: mixing the dough, shaping the loaves, stretching the pizza, sweeping the floors, bagging the cookies or helping out a customer at the counter. If you are lucky enough to have him help you, you will discover a man who still speaks with a gentle French accent who is passionate about the food he produces. His knowledge and enthusiasm will leave you wondering if this man is a baker or a teacher and philosopher. For those of us who know him well, we know he is all of the above. We invite you to taste the bread baked by a man who is truly committed to bringing better food to this world.